Have you ever wondered where the clothes you and your family wear come fromâ€¦or the dressing you put on your saladâ€¦or the sheets and towels you use every day? Did you know that fine writing paper, medical supplies, plastics, cosmetics, recording tapes and even the money you use to buy these things are made from COTTON? Cotton’s Journey a Field Trip In a Box kit includes: 1) Lesson guide 2) Cotton bolls of Pima (six) and Upland (five) varieties grown in the United States 3) Samples of cotton in various stages 4) Cotton planting seeds with instructions 5) Cottonseed oil 6) Colorful 24″x33″ poster showing cotton in six stages of growth 7) Student booklet parallels included video 8 ) Fabric dictionary defines weaves and their uses 9) Production flow chart takes the student from planting through harvest and processing stages and 10) Approximately 25 minute live video documentary of the history, production and processing of cotton. The lesson guide is divided into three units written for grades 1-3, 4-6 and 7-8, provides a glossary, and recommended literature and resource list. Each lesson lists the objectives and the standards fulfilled, and follow a simple format to allow for quick reference, flexibility and time efficiency. 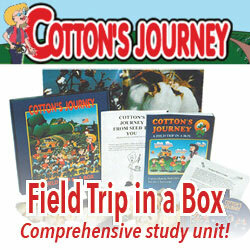 Cotton’s Journeya Field Trip In a Box curriculum is meant to give inquisitive minds a whole unit experience through the provided lesson guide & classroom resources. It puts into practice the inquiry-based approach and meets National Education Standards for English/Language Arts, Math, Science, and Social Studies. Lessons are easy to follow so that you may take ownership of this study unit by, determining where each lesson fits into your plan; personalize curriculum to the needs of your children; and the opportunity to utilize curriculum that supports national recommendations. Students are allowed to research and collect fact, achieve discovery, make sense of practical reasoning, and relate to actual pieces of their lives-forming connections. The open-ended discussions, group learning and hands-on activities will create challenging learning. Lessons tie into other study topics as pre-Civil War economy, ancient cultures and the development of cotton in Egypt, gardening, life cycles, technology, U.S. colonial history and how agriculture affects our lives today. The steps between planting and finished product and an appreciation for the many ways cotton food and fiber enriches her/his life. Cotton’s Journeya Field Trip In a Box lends itself as enrichment to the core subjects, as well as the basis and rationale of each. The rise of ancient civilizations, the American colonies into independent states and the United States as a major world power are inextricably intertwined with the cultivation of cotton and lend themselves to a relevant and interesting method of teaching Social Studies. Life Science concepts relating to plant structures, growth and genetics become more relevant to students when they are able to make real-life associations. Math is addressed by using calculating skills of Number Sense; Statistics, Data Analysis and Probability; and Mathematical Reasoning. English/Language Arts may be fully integrated through a multicultural flavor of both real and fictional characters that faced adversity during pivotal eras in US history with strength, courage and determination. Student’s comprehension can be measured through a variety of response activities. Concepts are reinforced through daily observations, journal entries, and research projects. Objective: Student will be able to experience the production of paper and realize that cotton is a renewable product. Tear Abaka paper or shred cotton linters (found at an art supply store) into small pieces and soak in warm water for at least 15 minutes. Fill a blender with 3 cups of water. To prevent damage to the blender, turn it on low and slowly add ½ cup of linters. Grind the linters into a soupy mash or slurry. Pour the pulp into a dishpan half full (14 cups) of warm water. Add 3-5 batches of slurry. Carefully slide a piece of window screen under the slurry. Lift the screen and drain the water. Evenly spread the layer of pulp on the screen. Place the screen upside down on several sheets of newspaper covered with a thick towel folded in half. Absorb as much water from the underside of the screen with sponges or rags. Cover with waxed paper and use bricks as weights to press water from the fibers. Allow the fiber to dry overnight. Remove the bricks and waxed paper and carefully peel the sheet of paper off the screen.